Our mission is to facilitate and further extend Breckenridge Grand Vacation’s philanthropic reach and impact in Summit County and the surrounding area. Inspired by the late BGV Owner/Developer, Rob Millisor, this charitable program honors his example of service to others by supporting the local nonprofit community. 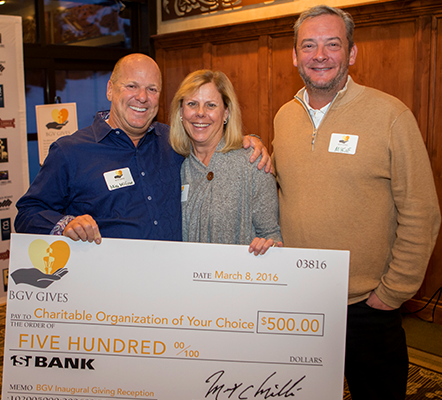 BGV is excited and humbled to continue Rob’s legacy of giving through fundraising, sponsorships, grants, volunteering and in-kind donations on behalf of those in need, with a primary focus on health, human services and education. With guidance from the BGV Gives Program Manager, Deb Edwards, this program is committed to growing BGV’s local contributions and inspiring fellow community members to give more, by providing resources and opportunities to help those in need. Save the Date! Join us on Saturday, June 8, 2019, for The 4th Annual Rob Millisor Heart Health Walk. Giving back to Summit and surrounding counties has always been a cornerstone of Breckenridge Grand Vacations’ mission. Without the support of the local community, Breckenridge Grand Vacations would never have been able to achieve the level of success that has created four incredible properties in Breckenridge; Gold Point, Grand Timber Lodge, Grand Lodge on Peak 7, and most recently, Grand Colorado on Peak 8. BGV Gives was created to honor the legacy of Rob Millisor and his passion for giving back to the community, both locally and in the world. This new program was implemented in 2016 and will facilitate and further extend BGV’s philanthropic reach and impact in the community. We are both humbled and excited to pay tribute to Rob in honoring his example of the importance of service to others by supporting the nonprofit community. The BGV Gives program was created to support the Summit County and Park County nonprofit community through fundraising, sponsorships, grants, volunteering and in-kind donations on behalf of those in need, with a primary focus on health, human services and education.